Yes that is indeed a trailer load of maroon machinery. One thing missing was the collar for the planing attachment arm but the resourceful Vin who is a retired engineer after all came up with a cunning plan to get around it. He wrote it up and sent me the details and also suggested a technical page for the site where repairs or fabrications could be shown to enable other readers to keep their machines doing what they were made for. I agreed with him and now must clear some space on the site as I am very near the limit of what my host server allows me. I will look through the site traffic and weed out some of the pages with the least interest but incorporate things where necessary. Vin sent me some pictures of the machine and attachments which will be posted up in Even More Readers Machines soon. And I can report unbelievable scenes at the London Stadium as Andy Carroll bangs in the winner in the last seconds of extra time! The three points gained lift us out of the relegation places. A Happy New Year indeed for now. The succinctly titled Technical Stuff page has been set up and the first feature is Vin's fabrication of a threaded collar for attaching the planing attachment to it's extension arm, an item that was missing from his trailer load of maroon metal therefore rendering the planer unusable. Well played Vin, a cracking demonstration of British engineering talent. An article on replacing the bearings in his Major planing attachment is now posted in Technical Stuff. The articles are posted in pdf form so just click on the highlighted text to read it. Some pages gaining the least interest have been removed in order to make room for this new section. Edmund from Blackpool sent in pictures of his latest restoration, a Coronet Majorette that had been abandoned in a garage. It is great to see this superb machine having been given a new lease of life and ready for work. Thanks Edmund. Back in May last year Zak asked me if I could help him out with a couple of bits of kit for his Coronet Minor donated by the Chelsea Hospital personality Ray Pearson for which I had already sent some spare parts. He needed a faceplate and hopefully some more planer blades, all of which was easy enough for me to get together. The problem was the shipping. However we had a cunning plan. I liaised with Workaid to piggyback the spares on their next container to Kenya so all I had to do was deliver them to Netley Marsh. Over the next few months I would Ask Zak several times if they had arrived and the answer was always No, until today that is. I received the following picture below. 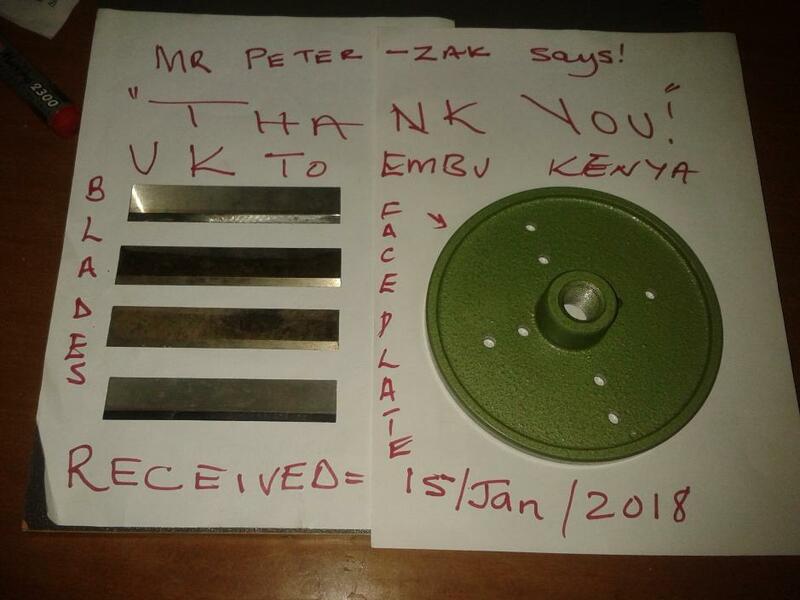 Zak had to trek approx 80 miles from his workshop in Embu, Kenya to Nairobi to the YWCA centre which was the collection point for the consignment of tools aboard the recently arrived Workaid container 'Leah'. That is approx seven months from request to delivery. Even by Boleyn Workshop standards that is a long time! PS You're welcome Zak, anything for a Twin Workshopper. And if that doesn't warm the heart of your cockles then you are probably Jeremy Hunt. In other workshop news I received another email from Malta requesting a manual for a newly acquired Minorette. The accompanying photo revealed it to be possibly the palest coloured machine yet seen. Christian from Malta has plans to restore this machine so I'm hoping to see it in Even More Readers Machines in the future. And in Post Office Red of course. It's Walker Turner time again. My mate Julian Harrison who took the DP700 off my hands has sent photos of some of his latest work and I have decided that to do his work justice he needs his own dedicated page. It is inventively named Julian Harrisons Workshop and is currently under construction with loads of pictures waiting to be posted. Below is a cheeky little taster of what to expect. Had a couple of interesting emails on the weekend. The first was from Arthur who has a Coronet Classic 10" and offered me photos so hopefully that will be added to the Boleyn Workshop gallery soon. 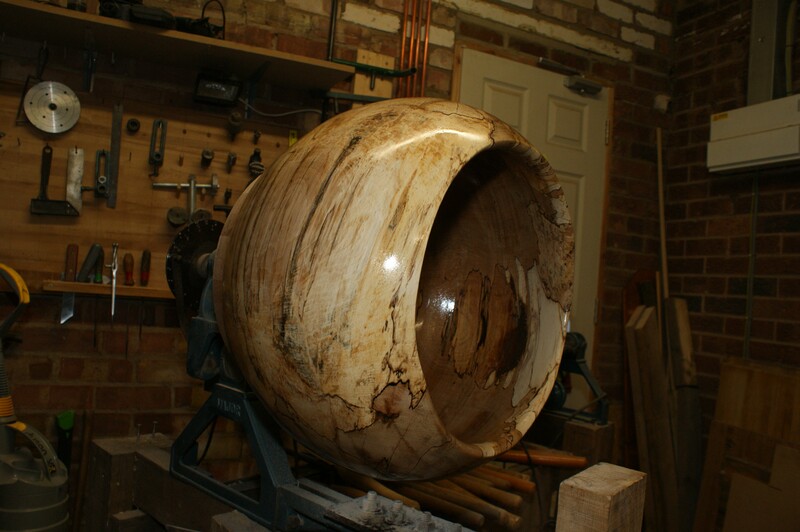 The second was from Seb who knocked up an ingenious little jig made from two Coronet Majors to turn a huge spalted beech bowl. Huge enough in fact for a small child to sit in. Now I cannot reveal that particular photo but have a look in the gallery below to see the ingenuity and skill of one man and his Majors. They're blue but hey, we're all friends here. 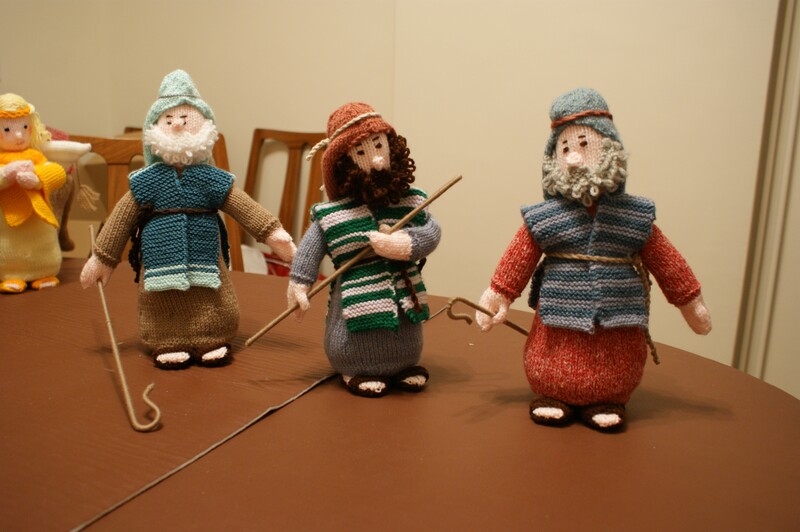 In case you're wondering about the relevance of the knitted Nativity figures, the Major was used to wind wool onto the shepherd's crooks. The photos are taking two or three seconds to load but please bear with, bear with until I can resize them. The transfer window is open again and there is as much movement in and out of the Boleyn Workshop as there is in the London Stadium. While West Ham United is apparently the 17th richest club in the world the Boleyn Workshop probably ranks as one of the poorest. Like the current squad I am also carrying a lot of dead wood which needs shifting on but as long as we're still in the FA cup I'm a relatively happy Hammer. Just don't mention the stadium. It's funny that Arthur should mention a Coronet Classic 10" as a couple of days later Stefan from Sweden emailed with pictures of his. It is hard to take a bad photo in this digital age but eminently possible as I have proved myself. But the money shot, in this case of the Classic 10 was a little beauty so feast your eyes on the image below..
Did I say we were still in the Cup? Flicking through auction sites on the weekend I came across a Coronet Capitol planer for sale. 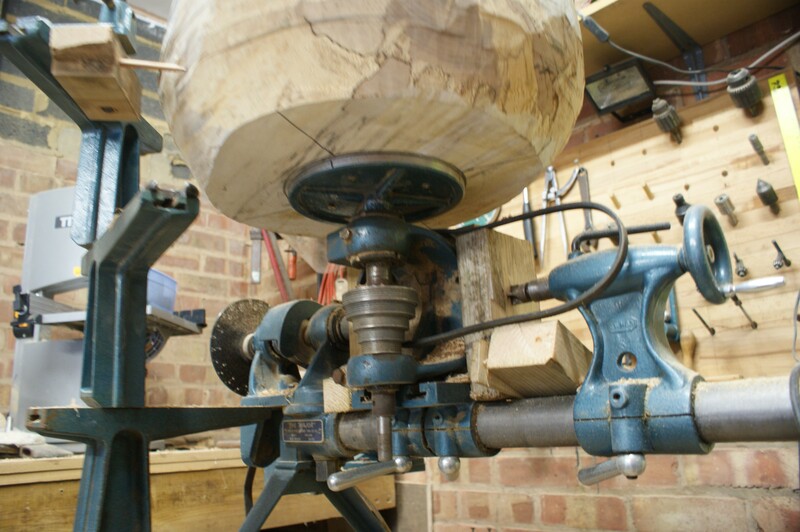 Funnily enough this machine turned out to be one of Edmund's (see above) previous restorations which he had sold on to a buyer with excellent taste in woodworking machinery. Quite rightly described as "outstanding" by the seller I thought that it would look good on the Boleyn Workshop website so I lifted the pictures and posted them on the Coronet Capitol page. I also posted a link to the auction site (no, I am not going to name it) page where it was listed in case any reader fancied it. COMING SOON... I received an email last year from a man called Dave "Rubber" Coates who is the proud owner of no less than a Coronet Major General. This was the largest and perhaps considered top of the range model made by Coronet and Dave's is no exception. 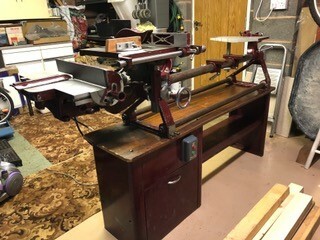 Having previously sent me some paper photos he has offered me the opportunity to visit him and his machine and record it digitally for the website. This simply has to happen. I have previously only heard from one "General" owner before though have seen one very basic barn find in very poor condition on an online auction site. Fortunately Dave lives within travelling distance of me so will be planning a day out for that and am excited at the prospect. Coronet Classic 10" bandsaw pictures live on Boleyn Workshop now. Link below. Trawling through last years laptop which got requisitioned by an A-level-doing child I found some photos which readers had kindly sent in but not posted. Now I do not know whose is which. There is also a mugshot of a bloke. Now I remember this geezer telling me I could post his mugshot with his machine but I cannot recall who he is. So I'm going to post in a new page called Unidentified Owner/Machines. So if you sent in photos but they were never put up, have a look on the page and tell me whose is what. And apologies to those of you who did. Update: I was under the impression I was sending them to an iCloud but when I checked they had not arrived. So if anyone can guess where these photos might be? Ah well who cares. Back to business. 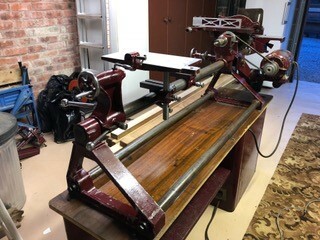 Julian Harrison of julian-harrisons-workshop.php has been busy sending the photos of his Walker Turner machine restorations which I have been uploading to his page. The page is looking great with each machine having its own gallery showing before, during and finished photos not to mention a video where possible. Jacob Querido, an 80 year old hobbyist woodworker in his own words, messaged me from his workshop in Quandaam which is approximately 8km (4.97 miles in old money) north of Amsterdam in the Netherlands. He owns a Coronet Imp which had been a gift from a British furniture maker who inherited the machine from his father, a model maker. It is always interesting to realise how these machines have ended up in a foreign land. The Coronet logo on the frame was not boastful. He was enquiring about a replacement drive belt and I was hoping to be able to locate one for him but it was not to be. The drive belt for the Imp, I believe was an in-house design and therefore never replicated anywhere. I made some enquiries but even the Coronet guru Derek Pyatt had not seen one in twenty years. If any reader can help out our friend in the Netherlands then please contact me at pete@boleynworkshop.com. I started to think about a solution. Was there a possibility that you could replace both the pulley wheels and use a vee belt or similar while keeping the speeds the same. The belt on my Imp seems is not an industry standard so I'm wondering if it was another in-house production. I shall post some photos one day. Epidural booked on Feb 13th so fingers crossed there will be some practical workshop time in the not too distant future. Julian Harrison has been busy providing me with digital evidence of his superb restorations from his Kent workshop which are all illustrated on his Boleyn Workshop page julian-harrisons-workshop.php Updating the website is an excellent distraction for me and keeps me out the biscuit tin. A week on from the 13th and sadly not much improvement. On a more hopeful note my consultant said a referral for a spinal cord stimulator may be possible if this trans-laminal epidural proves to have failed. Although I swore off surgery after the post-op spinal infection which followed my second double laminectomy the last year has swayed me. As the consultant said "you're still a young man." I like him. There were two requests for manuals this week, one from the sneezily named Achnasheen (bless you) in Ross-Shire and one from Bovey Tracey in the West Country. One exciting email I received this week was from Daryl who lives in Derby not far from the Alfreton Road/Mansfield Road site of the Coronet factory itself. Apart from requesting the Brook Gryphon motor diagram pdf he sent some pictures of his newly acquired Coronet Major which only turned out to be a Major General! Check out the gallery below. Incidentally I contacted Dave "Rubber" Coates and will be arranging that visit soon. It's a bit of an ongoing saga this General and it's only personal circumstances that are keeping me from viewing this piece of British engineering history in all it's glory. Fortunately Dave is very patient. I was sent some scans of Coronet articles from Garner Tool News by Martin which were really appreciated and will be posted up soon on the Coronet literature page. He also has some more which will be interesting to see. There have been three requests for manuals so far and the latest was from a chap's daughter on his behalf for the Minor manual. This chap is 89 years old and is rebuilding a machine that came from a neighbour who was getting rid of it. His daughter was very pleased to have located a manual for him. His name is Mr Christmas so have I actually sold a manual to a father Christmas? Ok so it's a tenuous link but I'll take anything I can get. I managed to get up to the workshop to clear the floor and the workbench from the winter's detritus but zero restoration has been achieved due to the failure of my last epidural. On a positive note I have really enjoyed cataloguing and displaying Julian Harrison's work on his dedicated page julian-harrisons-workshop.php proving that it is possible to live vicariously through someone else's workshop. 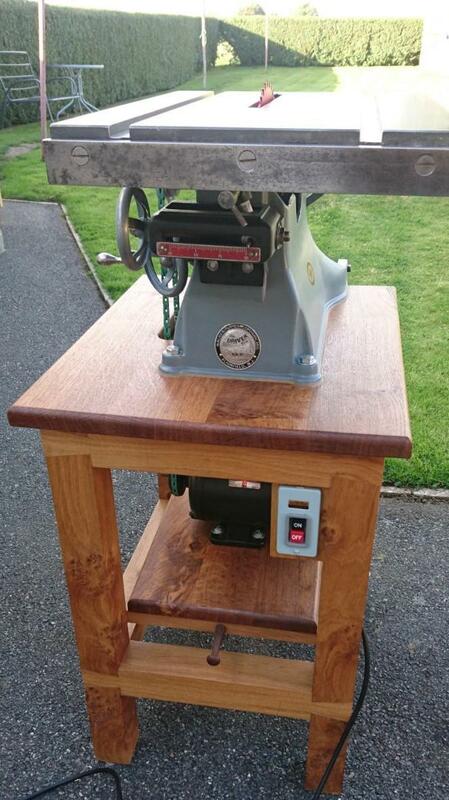 I have also posted his 6" jointer on OWWM hopefully to increase site traffic and to introduce our overseas friends to the classic British engineering that is Coronet. The Coronet posters displayed in coronet-advertising-etc.php have been re-scanned at a lower resolution to eradicate the pixellation created in the original scans. They look much more like the original posters now. A big thanks to Ray from Stoke-on Trent who kindly re-lent the originals to me for scanning. Continuing to live vicariously I have posted up Julian Harrison's latest project which is a Walker Turner J915 scroll saw from approx 1947. This has also gone up on http://www.vintagemachinery.org/photoindex/detail.aspx?id=34351 where a sample of the photos can be found. Back on the Coronet theme I had a very interesting hour long chat with Martin from South Yorkshire who had sent in some scans from an old woodworking machine of a Garner Tools advert featuring Coronet machinery. We chatted about various machines and he kindly offered to send some more scans of other items that I have not seen before. I will post up what he sent me soon. Apart from selling a Minor spindle and bronze-phosphor bearing it has been pretty quiet. I have not been able to get back up to the workshop since that brief tidy-up so have been sulking manfully. Back to the pain service on Thursday so we'll see what happens. In the meantime keep it Coronet! Things have livened up a bit this week with texts and emails rolling in. 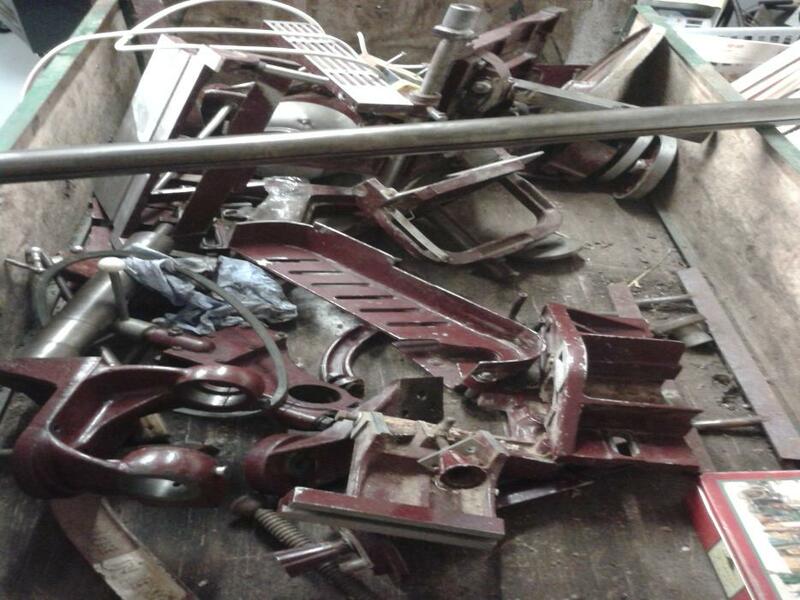 Firstly details of some more Coronet literature and secondly a fully restored machine that might well have been reported to the RSPCC (Royal Society for the Prevention of Cruelty to Coronets) if spotted in it's East Leicestershire shed by a concerned member of the public. So first an update on the lit. Some time ago (see above) I was contacted by Martin from Yorkshire who had found amongst other items some very early adverts for Coronet machinery in a tool catalogue named Garner Tools News. Now they actually produced a special Coronet Major edition to promote the machine which included brief testimonials from satisfied customers all over the British Empire as it was. This is not only interesting from a Coronet point of view but also it is a fascinating insight into times well gone by. It mentions that the design has been worked on for about two years which as the company started in 1947 means that it must be dated approx 1949-51. (Correct me if I'm wrong anybody?) At present it is still in PDF form but I hope to post it here soon after a struggle with technology. I'm wondering if PDF stands for Pretty Damned Faulty because trying to do anything with them makes me Pretty Damned Furious. Martin also produced an advert from a Woodworker magazine dated Feb 1951 (also in Jan 51 edition) showing a very early Major with a distinctive feet shape. It's yet to be confirmed but this could be one of the, if not THE first Major model. Thanks for your continuing interest Martin. There is a rare Coronet lathe on *bay right now. 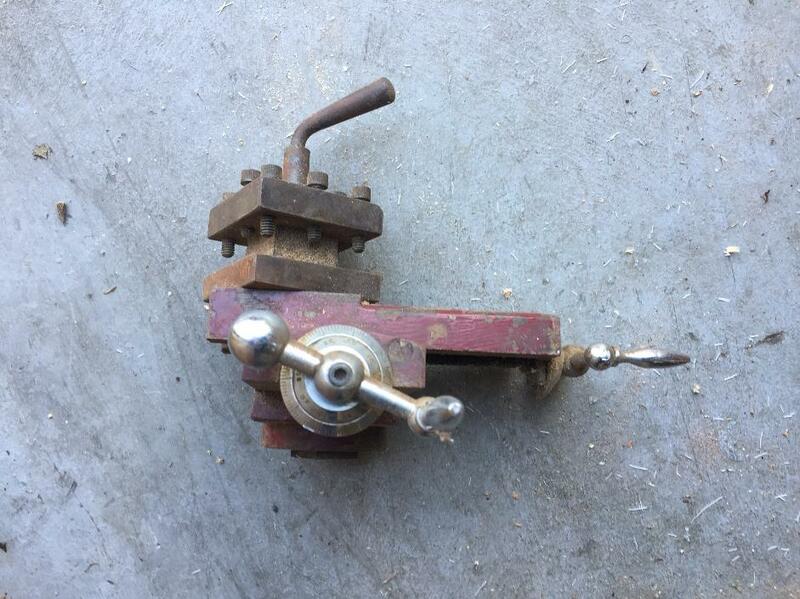 I had spotted this at the weekend but was also alerted to it by Pete the Hedge who sent the link to the item which I will attempt to reproduce here: https://www.ebay.co.uk/itm/WATCHMAKERS-8mm-CORONET-RUBY-LATHE-MILLING-MACHINE-5-SPEED-MOTOR/392020683139?hash=item5b4640e983:g:s-wAAOSwUZNawg62 These rarely come up so by all means buy it and send me some more pictures! On the whole it's been a pretty rotten month watching my elder brother suffering with a particularly nasty and rapid form of cancer. The speed with which it destroyed his life was simply frightening. Eight weeks ago he was working his welding/fabricating/mezzanine floor business and early yesterday morning he died. There will be a minutes silence observed in the Boleyn Workshop on Saturday May 19th at 11am. Finding the need to occupy myself this evening I decided to head up to the workshop, to blast out a bit of punk and strip down the Meddings floor drill ready for transportation to it's new home. For the music I chose V2 by the Vibrators. The album's intro of a V2 rocket sounds as it flew before cutting out, falling silently and then exploding was the ideal expression of my mood. I did wonder due to my mood whether both me and the Meddings would survive this stripping down or whether we would both fall to earth and explode much like a V2 itself.. Several days ago I had liberally coated the post, motor nuts/bolts, base plate nuts/bolts with penetrating oil to aid the removal process. First job was to remove the switch from the plate attached to the drill head in order to remove the motor. Next the Metropolitan Vickers motor itself was removed along with the motor plate and put to one side. 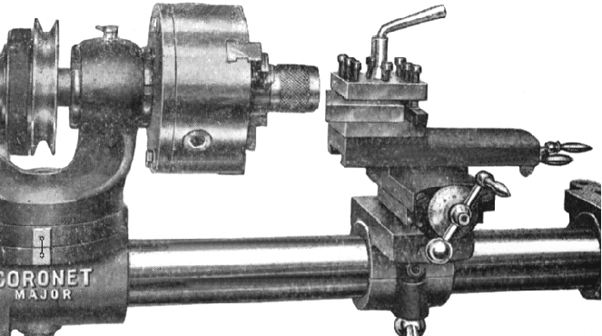 The Meddings drill head is heavy no two ways about it. It was not going to be possible to lift it directly off the post due to the height of the workshop ceiling and ahem ahem the sheer darn weight of it. However I have a cunning plan for floor drills which involves tilting them over until they are resting on a (collapsible) workbench between the wooden tops which are then tightened together gripping the post. This makes it substantially easier to remove the head but don't try this at home. It is indicative of my present state of mind that it was only when I had the entire weight of the head in my arms that I realized that I was still wearing flipflops. Again, don't try this at home. Perhaps I should look into getting some steel capped flipflops just in case it happens again. 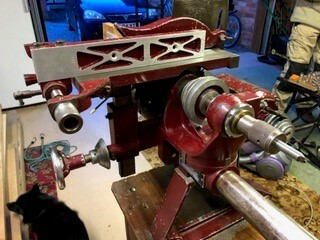 Once the drill head was off it was easy to remove the small tray and the table before loosening the bolts holding the post to the base and lifting it off. All in all a good hours work at my pace ie slow. Due to the testing events of the last month I think I can be forgiven for not mentioning that the Summer Transfer window is open and that an exciting move has already taken place. I was contacted by an old workshop buddy Mike who was after a guide/fence for a Coronet Major. In the event we ended up at cross purposes as I thought he was after a mitre fence when he was actually looking for a rip fence for the table saw. However he did not have a wasted journey and not only because he was visiting the internationally known Boleyn workshop. (Yeah I know..) We both spent some time admiring my old Meddings 2-speed floor drill and before very long had agreed a swap for his Walker Turner dp700 bench drill. Now this WT is the very one featured on my site with the earlier 1930s badge on the head and not only that but the soughtafter original art deco switch is fitted. Now you might not think an old switch is not anything to get excited about but this one was designed in the art deco period of the late 1920s/30s when even machines were designed to look pleasing as well as to be functional. I can feel a complete rebuild coming on and the need for a chat with old workshop mate Julian Harrison for the original paint code. On a maroon note Jon White sent in some pictures of his Coronet Consort restoration which is nearing completion. Yes, I am indeed posting while the World Cup is on. But in my defence I am waiting for the ko between Mexico and Brazil this afternoon amd have a spare 20 minutes. I actually have a spare 24 hours but that's not the point. 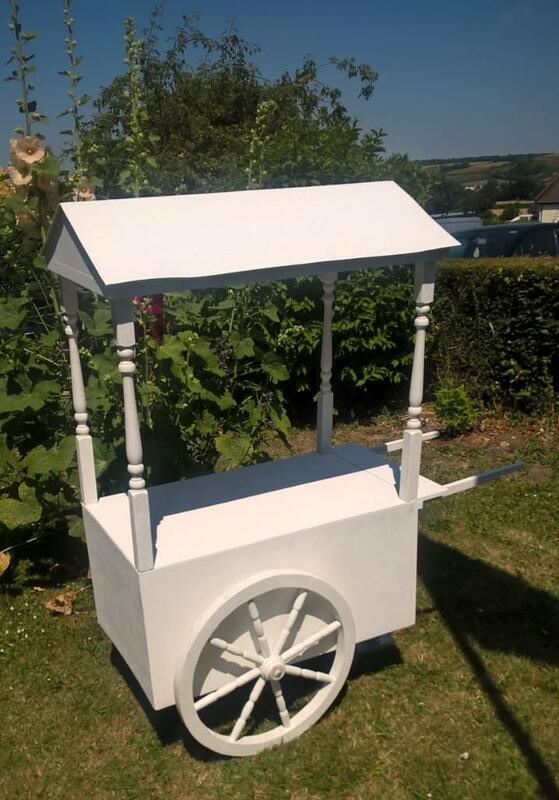 So for those of you who wonder whether anything comes out of the Boleyn workshop that isn't maroon, red or blue then have a look at the sweet cart below. It's white. It has been made for my assistant's mum's wedding in August and was finished a week before the completion date. No, it was really. Made from timber that was just sitting around it is finished here in white undercoat as they are going to add decoration themselves. Fortunately I made it in separate parts that come apart so it can fit into a reasonably priced middle sized car. The roof removes as do the pillars and frame. The wheels, handles and front steady can also be unbolted and removed. Right I'm off, they're doing the national anthems. 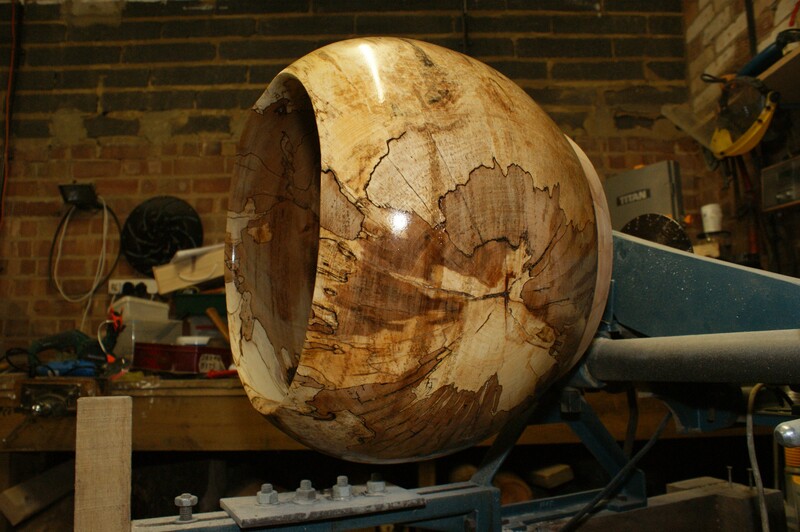 To follow are photo updates from a reader and an inspirational top tip for that final polish. Wow what a World Cup that turned out to be. It kept me off the laptop and out the workshop so I have a lot of catching up to do in both areas. 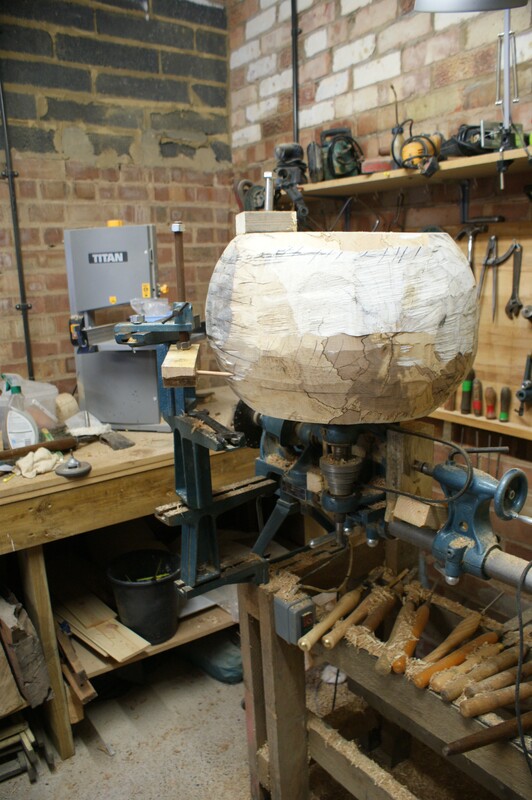 Typically my web server is not letting me upload photos so Jon's sterling work on his planer is going to have to wait even longer but it will be done as soon as possible. One Coronet attachment I get asked about a lot is the very rare metalworking attachment, the compound cross slide which was offered with the earliest Majors. It was discontinued with the colour change in 1977. It was possibly too expensive to produce and perhaps not enough interest from the Coronet buying public to make it a viable product. As with all of the Coronet machinery the high quality of it's design and fabrication possibly made it prohibitively expensive and therefore unprofitable to produce. Very occasionally one surfaces on an online auction site and attracts a lot of attention. This week I was contacted by Frank Tennick from South Africa who had possessed a Coronet Major since 1969/70. He sent me a picture of an attachment for which he wanted a positive identification. 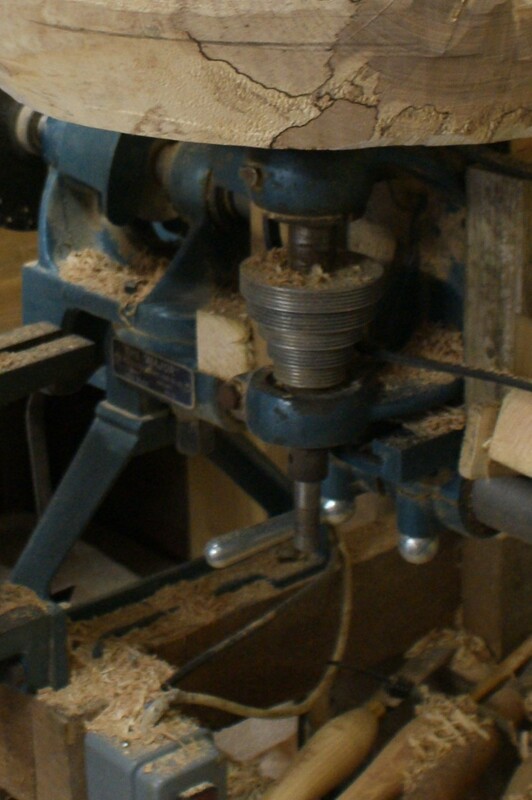 I forwarded the picture to Derek Pyatt of www.coronetwoodworking.co.uk who confirmed that it was indeed a Coronet compound cross slide. See below. I must point out that this item is not for sale. 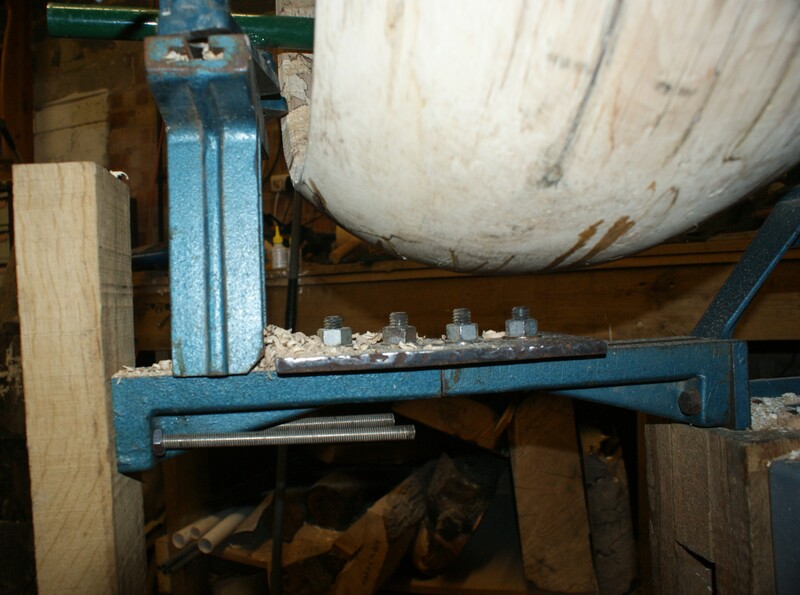 And in this other picture that Frank sent you can see the tee slot for where it would fit onto a saddle on the lathe bed. 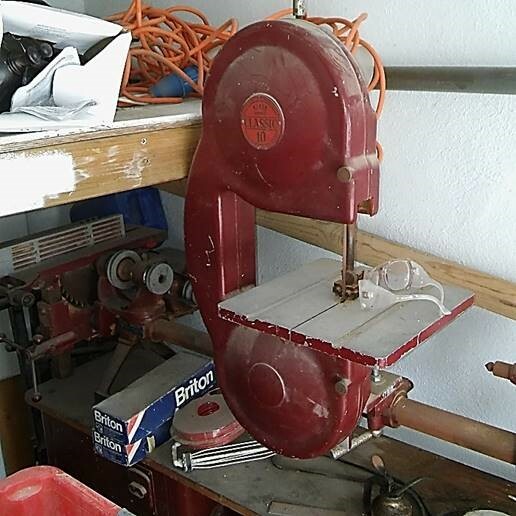 When he acquired the lathe the seller had previously rigged up a pulley system to reduce the speed down enough for metal turning. Frank very kindly searched his collection of brochures to find this original image of the compound cross slide. I wonder what it would have cost brand new back in the maroon day. A big thank you to Frank and also his son Dave, both from South Africa, for their correspondence and contribution to the site. Incidentally our contact started after Dave noticed in Readers Machines 2018 on May 29th that a misunderstanding had led the sale of a mitre gauge to fall through between myself and workshop buddy Mike. Last year or probably the year before even, I was contacted by a chap called Dave Coates from Devizes (Wiltshire) who asked whether I would be interested in seeing his Major General. For a brief moment the world seemed to slow on its axis and the words on the screen became fuzzy and hard to read. No, it wasn’t my pain meds kicking in all at once or a medical episode requiring a 999 call but a natural reaction to being asked to view one of the rarest and the largest Coronet lathes produced. They don’t come around very often perhaps not only due to their initial cost back in the day but also because they are a damn serious bit of kit and will not fit into the average 6x4 larch lap shed. Not unless you want to get in with it yourself that is and perhaps not everyone does. But someone who definitely does is Dave Coates and his workshop is man enough to take one as well as a large woodworkers bench and other assorted machinery. More of that later. He bought the Major General some years ago although the price seemed high until the ubiquitous box of bits was produced when suddenly it didn’t seem so bad after all. Once firmly ensconced in Dave’s workshop the General was thoroughly cleaned, greased and oiled where needed before having the paintwork neatly touched up. The result is that it looks almost as good as it did the day it left the workshop causing two slipped discs and a minor hernia between the unlucky blokes carrying it. Having made initial contact it was still a further two years before I managed to visit Dave, Devizes not being a place I travelled either to or near enough to, to warrant its own visit. However after several postponements, delays and months of general memory loss I found myself with the need to travel to Chippenham to pick up a glass table top and the possibility of returning home via Devizes. As it happened, the Chippenham trip was a waste of time as in the eventuality the firm had sent the wrong size piece but as I said to the shop foreman; not a problem, I’ve got something better to do on the way home. And did I ever. I found Dave of Devizes easily enough thanks to the navigation aid built into my car otherwise it would have been a different story. 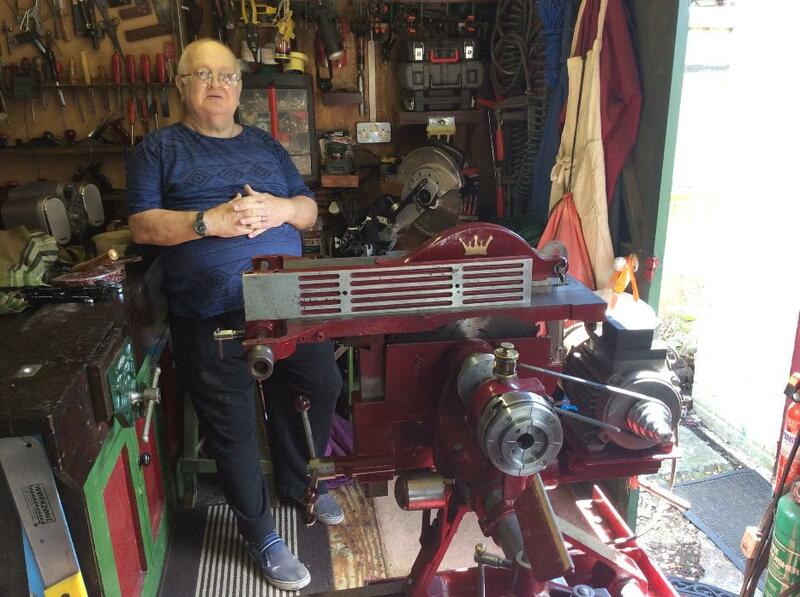 I was welcomed at the door and Dave firstly showed off some of his delicate turning projects that made it hard to believe that they had come from such a beast of a lathe as the General. In true Wiltshire hospitality Dave offered me a choice of one of three oak platters, finished with luminescent paint, he had turned himself that were hanging on his front room wall. And then we went to the workshop. Now I was never in the Armed Forces but when I saw that Major General for the first time I felt I should salute. There was only one word for the sight in front of me, majestic, awesome. Ok that’s two words but you get my point. How else can you describe the feeling that three solid steel bars instil in you if they’re not part of a cell door or in the deadly hands of ninja assassins? They say you should never meet your heroes but this was an exception, this machine met all expectations and went some way beyond. In truth my photos do not do it justice but that would be a good excuse to return to Devizes with some decent camera equipment and out that right. More text and photos to come soon. If you have been unable to access the Boleyn Workshop for a while it is because I forgot to renew the domain name. I was then presented with a bill of renewal with an estimated increase over 400%. However after speaking to mine genial host Yola they very kindly agreed to reduce it back down to the standard rate. It was either that or letting the site go down the virtual tube at which there would of course been global outrage. Who am I kidding. NORMAL (whatever that is) SERVICE WILL BE RESUMED SOON. In the meantime Keep It Coronet! There's not a lot being going on in the workshop this week so let's revisit the Coronet prayer. Right, after me. Hands together and eyes closed. Wishing all Boleyn Workshop readers past and present a very Maroon Christmas and a Post Office Red New Year!! If you have a blue machine I won't wish you a Blue Christmas as I am not Elvis Presley. The official email address is still down so please use dorsethammer@hotmail.co.uk thanks.